Statement of Purpose- To provide a minimum level of suicide awareness and prevention training to all public school personnel. This legislation will allow school districts to adopt a suicide prevention policy and choose an evidence-based gatekeeper program to implement in their district. 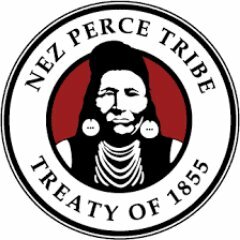 Fiscal Note- There is no cost to the general fund. Evidence based “gatekeeper” programs are available from a number of sources at no-cost to school districts, in addition to programs available for a variety of fees. History- This all began by listening to the needs of our youth and educators. We hosted meetings to collaborate with the State Department of Education, H&W's Suicide Prevention Program, IEA, IASA, ISBA, & neighboring state programs to determine what was needed, what was wanted, what has worked well elsewhere and what to avoid. We've collected feedback on a virtual survey and created a website to host as much information as is possible available. The Jason Flatt Act has the backing of many reputable organizations and has been implemented in 19 other states. 42 states have some form of "gatekeeper" education on the books for educators. We are certain that this is a small but necessary first step to combating Idaho's suicide problem. According to the latest (2015) data from the Centers for Disease Control and Prevention (CDC), suicide is the second leading cause of death for young people ages 10-24 (Centers for Disease Control and Prevention, 2017). According to the 2015 Youth Risk Behavior Survey, more than 1 in 6 high school students in the U.S. reported having seriously considered attempting suicide in the 12 months preceding the survey, and more than 8% of students (about 1 in 12) reported having attempted suicide in the preceding 12 months (Centers for Disease Control and Prevention, 2015). While these statistics point to a serious public health problem, we do know that suicide is preventable. Ninety percent of young people who die by suicide have a mental health condition at the time of their deaths, although often these conditions are untreated, under-treated, or undiagnosed. One of the best ways to prevent suicide is by understanding and treating mental health conditions. 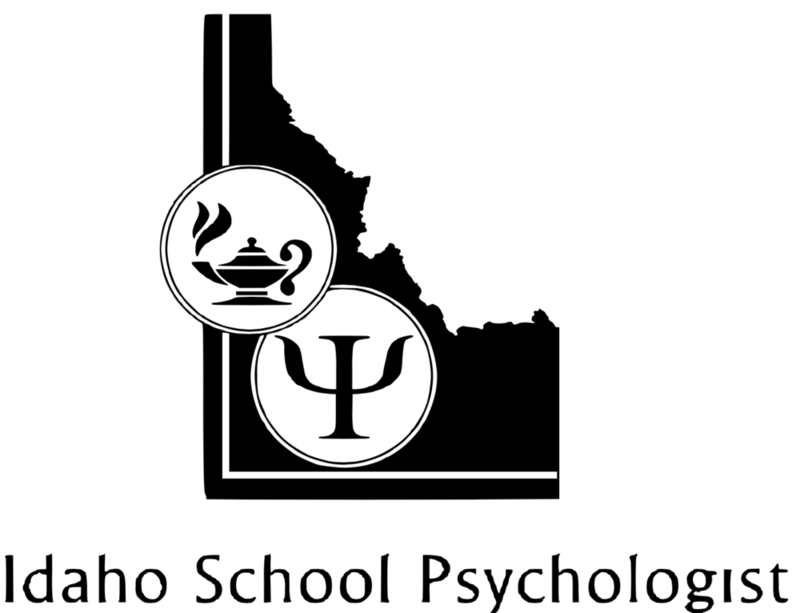 The first onset of mental illness typically occurs in childhood or adolescence, and as children and teens spend a significant amount of their young lives in school, schools have an important role to play in identifying students showing signs of a mental health condition or suicide risk, intervening with students presenting acute risk or who attempt suicide, and responding to completed suicides within the school community. 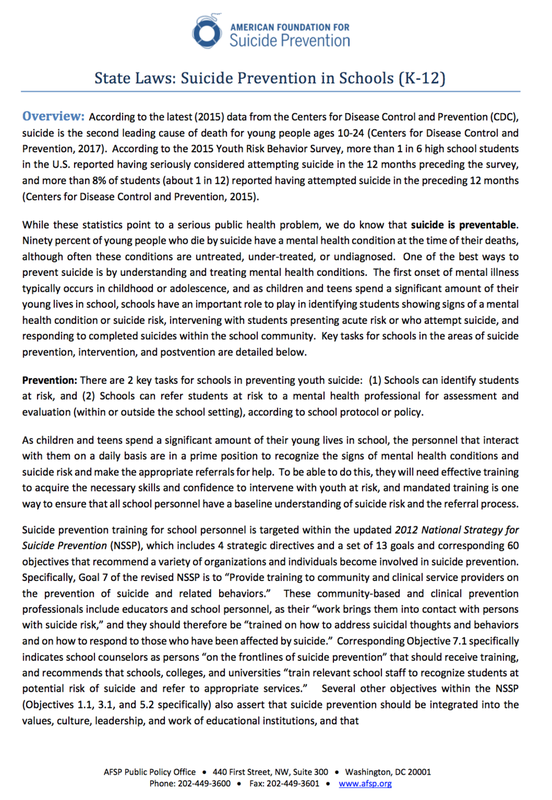 Key tasks for schools in the areas of suicide prevention, intervention, and postvention are detailed below. Prevention: There are 2 key tasks for schools in preventing youth suicide: (1) Schools can identify students at risk, and (2) Schools can refer students at risk to a mental health professional for assessment and evaluation (within or outside the school setting), according to school protocol or policy. As children and teens spend a significant amount of their young lives in school, the personnel that interact with them on a daily basis are in a prime position to recognize the signs of mental health conditions and suicide risk and make the appropriate referrals for help. To be able to do this, they will need effective training to acquire the necessary skills and confidence to intervene with youth at risk, and mandated training is one way to ensure that all school personnel have a baseline understanding of suicide risk and the referral process. Please share your thoughts on creating Jason Flatt Act legislation in Idaho by clicking the Feedback Requested survey below. 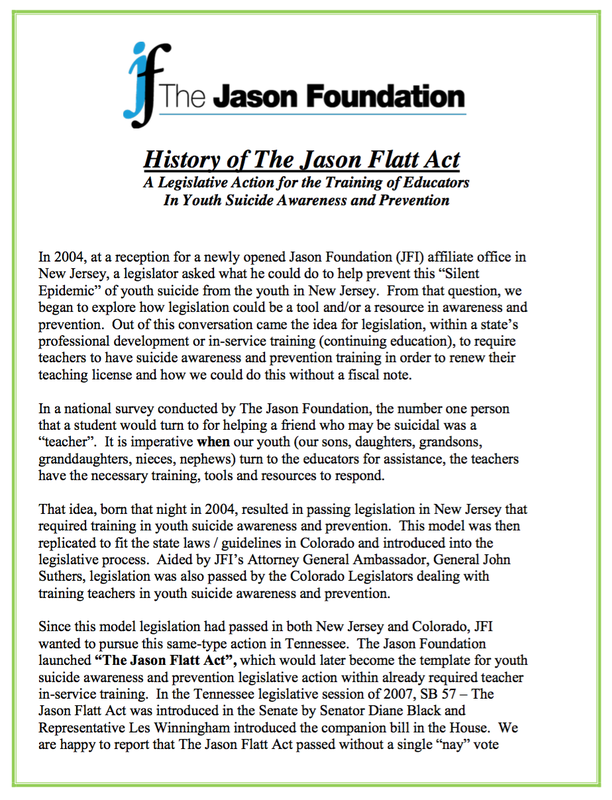 The Jason Flatt Act started as an idea that was presented by a young legislator in New Jersey in 2001. He asked, “Have you ever thought about working with teacher’s In-Service Training requirements to have educators trained?” That began our working with organizations in New Jersey and then Colorado to influence legislation for including youth suicide awareness and prevention training within Teacher’s In-Service and eventually resulting in basis for The Jason Flatt Act. In 2007, The Jason Flatt Act was first passed in Tennessee and became the nation’s most inclusive and mandatory youth suicide awareness and prevention legislation pertaining to Teacher’s In-Service Training. 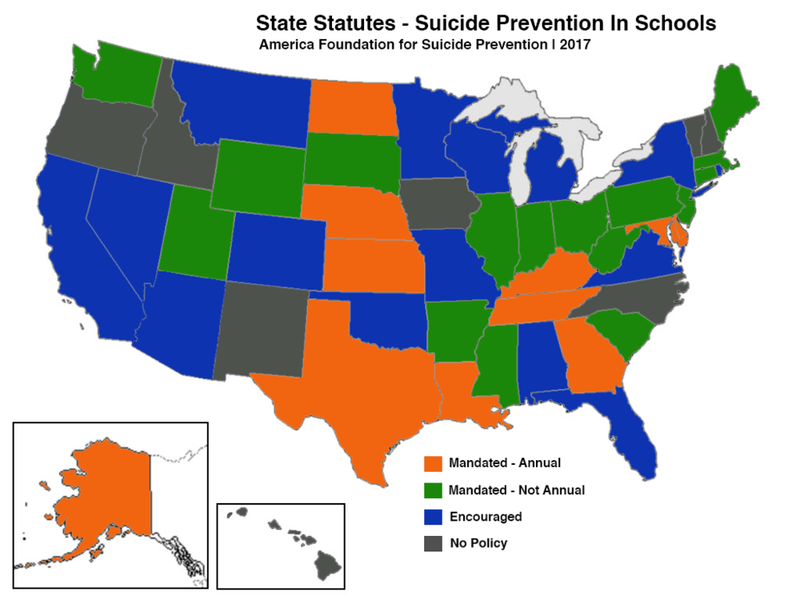 It required all educators in the state to complete 2 hours of youth suicide awareness and prevention training each year in order to be able to be licensed to teach in Tennessee. In all, 19 states have now passed The Jason Flatt Act (over 36% of all states). In all 19 states, The Jason Flatt Act has been supported by the state’s Department of Education and the state’s Teacher’s Association which points to the value seen in such preventative training. When introduced under The Jason Flatt Act, a state can pass this important life-saving/life-changing legislation without a fiscal note. Please share your thoughts on creating Jason Flatt Act legislation in Idaho by clicking the Feedback Requested survey above.